The debates about India's partition, Gandhi murder and politics of Nehru have been a matter of ceaseless debates. Each political tendency has their own interpretation of these events, which in a way are landmarks of sorts in modern Indian History. As such the phenomenon of Partition of India and assassination of Gandhi are interwoven in the sense that Godse held Gandhi responsible for appeasement of Muslims. Godse constructed his story around warped understandings of the events of the time to create the ground for murder of the Mahatma. These views are shared by many Hindu nationalists, who are in and around RSS-BJP. Now with the ascendance of BJP to the seat of power many of its leaders are coming out more boldly with Hindu nationalist interpretation of the events, but a twist is being added. This twist is apparent in the article by a BJP leader from Kerala in the RSS mouth piece Kesari. This article indirectly suggests that Nathuram Godse should have killed Jawaharlal Nehru instead of Mahatma Gandhi, as according to him the real culprit was Nehru and not Gandhi. The BJP leader who wrote this is B Gopalkrishnan. He says "If history students feel Godse aimed at the wrong target, they cannot be blamed. 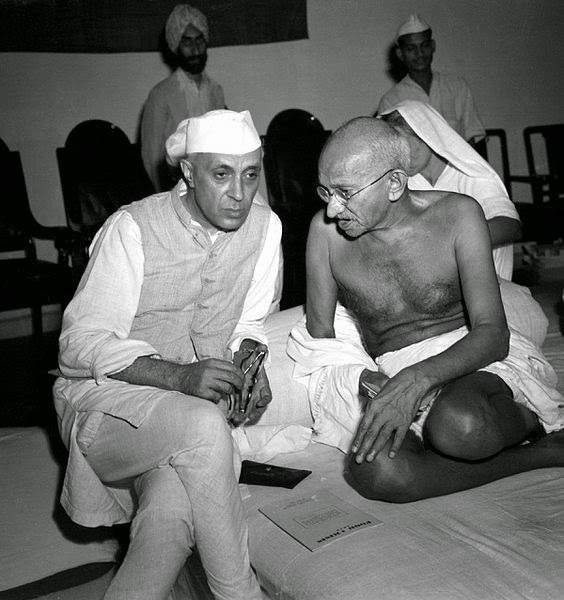 Nehru was solely responsible for the partition of the country.” What does one make of it? Is it the official RSS line? To be on the safe side RSS spokesperson Manmohan Vaidya has distanced the RSS from the statement of its leader. Still it is not difficult to guess that there may be prevalence of such thinking within the RSS circles on the lines of the author of RSS mouthpiece article. This Kesari article is significant as it is trying to shift the blame from Gandhi to Nehru. It may not be too difficult to understand the reason for the same. Before we have a look at who was responsible for partition, let’s try to understand why the blame is being shifted from the Mahatma to Nehru. Recently Narendra Modi launched Swachh Bharat Abhiyan (Clean India campaign) on 2nd October as a tribute to the father of the nation, Gandhi. This move has two shrewd aims. One is to appropriate Gandhi for the politics of Hindu nationalism; two is to reduce Gandhi’s contribution to mere cleanliness and hygiene. This over projection of cleanliness associated with Gandhi as such dwarfs the major contribution of Gandhi, Hindu Muslim unity and national integration in the deepest possible sense. Nehru’s staunch and principled commitment to Indian nationalism, pluralism, secularism and scientific temper make him a figure totally unacceptable to Hindu nationalists, as Hindu nationalism stands for the values totally opposed to these. So the attempts like this article are planned attempts for tasting of waters by throwing up Nehru’s name as the culprit for the partition tragedy. As such Gandhi, Nehru and Patel were the most prominent leaders of the anti colonial freedom movement. Gandhi was the central pillar, who built up the anti-British-Indian nationalist mass movement, gave it solid foundations and then gradually became the moral guide for the same. He passed the major mantle of his responsibilities to Nehru and Patel. Most of the times Hindu nationalists, Hindu Mahasabha-RSS, were critical of Gandhi’s efforts for Hindu Muslim unity. The Muslim communal stream, Muslim League looked at Congress as a party representing Hindus alone. The truth is that majority of people from all religions were with the Gandhi led movement for Indian nationalism. It is only after 1940s that more Muslims started shifting to Muslim League due to the rise of communalism. Gandhi was criticized by both communal streams, Hindu communal stream criticized him for appeasing Muslims, and Muslim communalists called him a Hindu representative. Partition was due to multiple factors. The first and foremost of these was the machination of British policy of ‘divide and rule’ which strengthened the communal streams-Muslim and Hindu both. Secondly British had an agenda of colonial masters. They perceived that a united India will be a power in its own right, more likely to ally with Soviet Union in global bipolar world. Their perception was due to the presence of a significant Left wing in the Indian National Congress led by Nehru himself. Partition tragedy was multi layered phenomenon, which cannot be reduced to a single incident. Many such incidents had their own impact on the totality of the phenomenon of course. We need to see the deeper differences between the Indian nationalists on one hand and Religious nationalists (Muslim League-Hindu Mahasabha) on the other and the clever role of British in partitioning the nation. That should be central to understanding the process, rather than putting the blame on any single individual. As per the perception of Hindu communal stream so far it was supposed to be Gandhi who was responsible for partition and for appeasement of Muslims, now this stream is trying to shift the blame on to Nehru as they need Gandhi as an icon, though freed from his core virtues of truth and non violence, reduced to mere ‘cleanliness man’. In no way they can appropriate Nehru, as Nehru lived after Independence to nurture the values of Indian nationalism, pluralism, liberalism and diversity, the principles which were the cementing factors of Indian national movement, the biggest ever mass movement in the World. So this Keasri, RSS mouthpiece article and the façade of its being disowned!